Early Learning Centre is the leading toy retailer for children aged -6 years. Early Learning Centre's fantastic toys are of temendous fun. It can help develop vital skills and help children get off to the best possible start. Early Learning Centre is the leading toy retailer for children aged -6 years. All our toys are designed to encourage learning through play, and develop key skills such as imagination, creativity and active play. Currently no active voucher codes have been listed for Early Learning Centre. You can visit elc.co.uk to view the latest offers. Shop Early Learning Centre Now. At VoucherSmarter.co.uk.co.uk, our dedicated team of deal experts are here to save you money by seeking out all valid Early Learning Centre discount codes, elc.co.uk voucher codes and money of coupons that are ready to be used when shopping at Early Learning Centre online store. For two days only, get 20% off all toys at ELC, don't miss out! Save 50% on selected toys at ELC, use this offer link to view all sale items! Receive 15% off your entire orders when you spend over £50 with this voucher code, plus free delivery! Receive 20% off art and creativity using this offer link, no voucher code required! 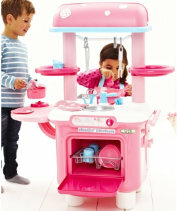 Get half term, half price on selected toys at ELC, use this offer link to view the selected items. Get 3 for 2 on selected toys and books! Simply visit site for more details, don't miss out! Get 20% off all online order of toys at Early Learning Centre, no voucher code is required! Take advantage! Receive free delivery on orders over £50(usually £100) at Early Learning Centre. Make use of it! 20% discount on selected Art & Creativity Soft Stuff Dough at ELC! Ideal gifts for kids! Save up to 50% on selected music toys at ELC! Don't miss the chance! Save 20% on your birthday present shopping with the Early Learning Center Big Birthday Club. Quote this code at checkout. worked for me 28th Oct 2009 - I actually recieved the leaflet with this code on it months ago but forgot about it. Seems you can use it anytime within the year as my childs birthday was at beg.march. Get free delivery on all orders over 65 pounds by clicking this link at checkout. Delivery was still applied on an order of £90 on Oct 26th. Use this discount link to get Half Price Sale today with some really competitive prices on a whole range of products PLUS some great value multi-buy deals too! Make your selection at Early Learning Centre and get free delivery when shop more than £75. Click one of our Early Learning Centre voucher/offer discount link and open Early Learning Centre site. Shop the Early Learning Centre online store. Enter Early Learning Centre (When available). Get the most popular exclusive Early Learning Centre money saving vouchers delivered straight to your inbox!